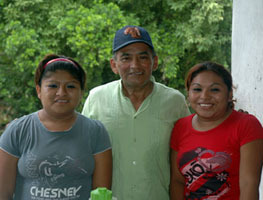 various Mayan Artists who sell their art within the Arcological site of ChichenItza. From their Hearts into your Hearts! 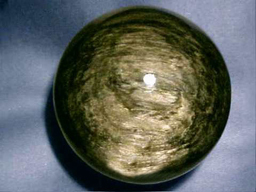 •Gold~Sheen Obsidian has wonderful golden reflections or sheen at certain angles. •Known to be a stone of protection. 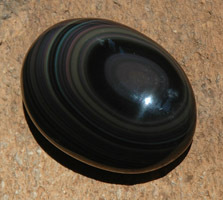 It has been said that Obsidian forms a shield against negativity. •Absorb negative energies from the enviroment . •Aids in blocking psychic attack. •Can be used to balance and clear the Third Eye and the Solar Plex. 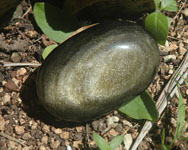 •Used as a massage stone it aids in relieving the pains and tensions of our bodies. 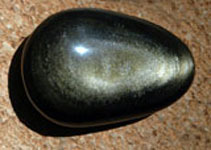 •Used during crystal healing Gold~Sheen Obsidian can give one insight into the crystals needed to achieve the healing process and help balance energy fields. 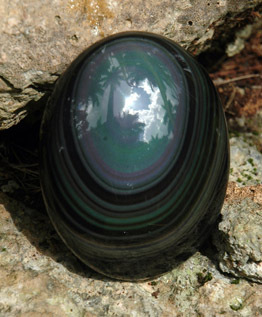 •Rainbow Obsidian is black obsidian that, when polished and exposed to Sunlight, shows bands of rainbow colors. 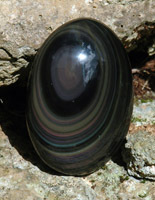 •Rainbow obsidian is particularly powerful in meditation to dissolve shock, fear or barriers. •It expands your consciousness, sharpens the senses and can help you delve deep into your Soul. 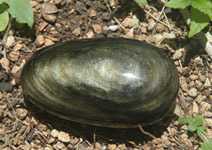 •Obsidian helps to protect the very sensitive against depression. •It is the stone of the soft hearted and gentle people of the world. •Use obsidian to help block negativity of any kind. •Place the Obsidian in a bowl of salt water, water from the ocean if possible. •Then place the bowl under the full moon light overnight. •The next day allow the sun to radiate it's warmth onto the Obsidian Stone. •It is now cleansed and charged.